You can find this plant from central coastal California to British Columbia (10). A. chamissonis can be found on west coast strand beaches and dunes from sea level to 50 meters in elevation (10). This plant will grow where there is between 20 to 100 cm rainfall per year (5). A. chamissonis is a perennial, adapted to the Mediterranean climate of the Pacific Coast, characterized by wet winters and warm, dry summers. This plant is found exclusively on coastal strand beaches and dunes. (3). Is found on the leading edge of vegetation in these areas (8). 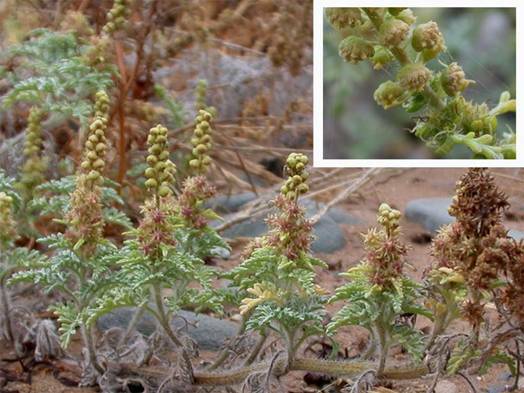 This succulent perennial plant will form large clumps in specifically dune and coastal dune systems (7). This plant tolerates full sun, salt, and sand (5). A. chamissonis is a member of the coastal strand community on the immediate coast of California (5). Locally, this plant associates with species found on the Olympic coast (9). Seed to produce container plugs (10). A. chamissonis blooms from July to November (3). Collect seeds from April 15th to December 30th – they drop off from the plant on their own when mature (10). Once pollinated, the female flower will develop into a prickly brown bur with a single seed inside (7). Cleaning these seeds is not required, but soak them in water for 24 hours, then cold stratify for 2 months, periodically checking seeds for radicle emergence. Sow in the soil type indicated in “Soil or medium requirements”. Mix seeds with media and lightly cover with soil. A. chamissonis germinates best from February to May. Germination has been lower in the summer months in a Marian County, California, greenhouse and overall percentage germinated was 50% 30 days after sowing (10). Better germination rates may be achieved if you sow earlier in the year. In Marin County, California, seeds were germinated in a fully controlled greenhouse. They were then transplanted 30 days after germination to containers. In the previously referenced propagation procedure, seeds were sown in flats containing a mix of peat moss, perlite, major and minor nutrients, gypsum, and dolomitic lime. After transplanting, they used a standard potting mix of peat moss, fir bark, perlite, and sand. (10). Prefers pH of 5 to 7 (5). Will grow in sand and sandy clay soils, as it was planted for a project by the San Clemente Island Naitve Habitat Restoration Program in 2003 (6). A. chamissonis has low water requirements (2). Forms mats 1-3 m. across and 15-30 centimeters high (4). (1) "Ambrosia chamissonis (Less.) Greene ." PLANTS Database, Version 3.5. USDA, National Plant Data Center. 16 May. 2005 http://plants.usda.gov/cgi_bin/topics.cgi?earl=plant_profile.cgi&symbol=AMBRO. (2) "Ambrosia Chamissonis." S&S Seeds Plant Database. 1998. S&S Seeds. 16 May. 2005 http://www.ssseeds.com/database/db_testvv.php3?uid=22. (3) Charters, Michael L. "Ambrosia chamissonis." Southern California Wildflowers and Other Plants. 2003. 16 May. 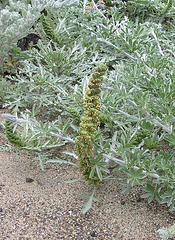 2005 http://www.calflora.net/bloomingplants/silverbeachbur.html. (4) De Ruff, Robert. "Beach Bur." Plants of the Upper Newport Bay. 23 Jul 2000. School of Biological Sciences, University of California. 16 May. 2005. http://mamba.bio.uci.edu/~pjbryant/biodiv/PLANTS2/Asteraceae/Ambrosia_chamissonis.htm. (5) "Franseria chamissonis bipinnatisecta ." Las Pilitas Nursery. 16 May. 2005 http://www.laspilitas.com/plants/1194.htm. (6) "Seed Collection, Propagation and Outplanting in Support of San Clemente Island Endangered Species Programs." San Clemente Island Native Habitat Restoration Program - 2003 Annual Report. 22 Feb. 2005. Soil Ecology and Research Group. 16 May. 2005 http://www.serg.sdsu.edu/SERG/restorationproj/channel_islands/shrike/3rd_annual_report.htm. (7) "Silver Beachweed." Plant Feild Guide. National Park Service. 16 May. 2005 http://www.nps.gov/goga/parklabs/library/plantguide/green-brown/silverweed.htm. (8) "Strand." Major Types of World Vegetation. University of California Botanical Garden. 16 May. 2005 http://www.botgard.ucla.edu/html/botanytextbooks/worldvegetation/strand/fulltextonly.html. (9) Turner, Mark. "Summer Wildflowers - Olympic Peninsula, Washington." 2003. Turner Photographics. 16 May. 2005 http://www.turnerphotographics.com/nature/flowers/flowers2003/030711Olympic. (10) Young, Betty. "Propagation protocol for production of container Ambrosia chamissonis (Less.) Greene." Native Plant Network. 2001. Golden Gate National Parks, San Francisco, California. 16 May. 2005 http://www.nativeplantnetwork.org/network/view.asp?protocol_id=549. Ivona Kaczynski, May 9, 2005.